I am always looking for a way to get things done that makes sense and saves money. I have to say that as of late I have been a little obsessed with this whole concept of efficiency and it led me to create a little adjustment sheet so that I could make changes to my grain bill. 3) from here is will ask you to sign in, assuming you don't have an account, you sign up for the free account and the program will send you an email to verify your account. 4) from there the document should be in your should be in your My Office tab and if you choose from the file menu, you can download the doc to your hard drive. The reason that I recommend downloading it to your computer is that the web adjustments don't work fast enough for my liking. 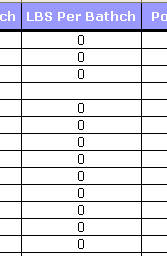 I know what you are thinking, no this is not a less than clever plan to plot worms on people's computers, this is an excel doc! Now the way that this is set up is there are a bunch of equations built into the doc (stick to sheet 3, it's the best one) and they will allow you to adjust a verity of items on your recipe to get the grain bill that fits. 1)The column to start with is the LBS per Batch, this is where you will enter in the amounts of the grains indicated in column A that the recipe you are planning calls for. 2)As you can see here, I have put in 1 lb of Chocolate Malt, 4.25 lbs of Belgium 2 row pale malt, and 4lbs of Belgium wheat malt. There is a recommendation about the amount of each of these mats you should use and on the far right column it lets you know how much you have in your recipe. 3)Now in the column labeled Adjust LBS there is a new number that is the result of the equations set in the spreadsheet. 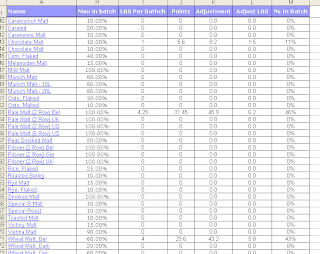 When you download the sheet, it is set at 54% efficiency so all of the adjustments are based on that. 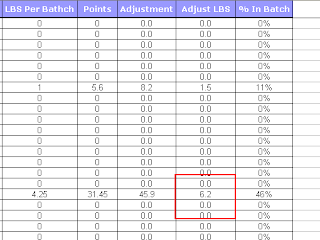 4) To adjust the efficiency to reflect your homebrewery, all you need to do is change the 0.54 number that is in the highlighted box to what ever your efficiency is, for example if you are at 75% efficiency, change the number to 0.75. The number on the spreadsheet will reflect the difference from that number and 1, so for 0.75 it will read 25%. I wish I could have made it do everything, but alas. 5) Finally when you have inputted your efficiency and the recipe you are planning on using, you should have an adjusted recipe to reflect your homebrewery's efficiency. If this doesn't work let me know. I am good with excel, but bad with math.